In an earlier post here at Mormanity, I discussed an intriguing aspect of the temple that Nephi built. I am especially indebted to a chapter from Kevin Christensen, "The Temple, the Monarchy, and Wisdom: Lehi's World and the Scholarship of Margaret Barker" in the Glimpses of Lehi's Jerusalem by John Welch, David R. Seely, and Jo Ann N. Seely (Provo: Maxwell Institute, 2004), and to Don Bradley's presentation, "Piercing the Veil: Temple Worship in the Lost 116 Pages," FAIRMormon.com, 2012. In that post, I noted how these LDS scholars help us recognize that the Nephites had sacred relics for their own "ark" that have remarkable parallels to the scared relics that were in the Ark of the Covenant of Solomon's temple. Four of the five sacred relics of the Nephites that I discussed have fairly clear parallels to their Old World counterparts: the interpreters like the Urim and Thummin, the metal plates like the stone tablets with the law, the sword of Laban as a symbol of authority like the rod of Aaron, and the Nephite breast plate like the High Priest's breastplate. The least obvious and most interesting parallel deals with the pot of manna preserved in the Ark of Solomon's temple. A possible Nephite parallel is introduced using language that may have been crafted to serve as a parallel to the sacred manna which, according to Exodus 16:13-15, was discovered in the desert in the morning and was described as "a small round thing" which obviously astonished them, "for they wist not what it was." 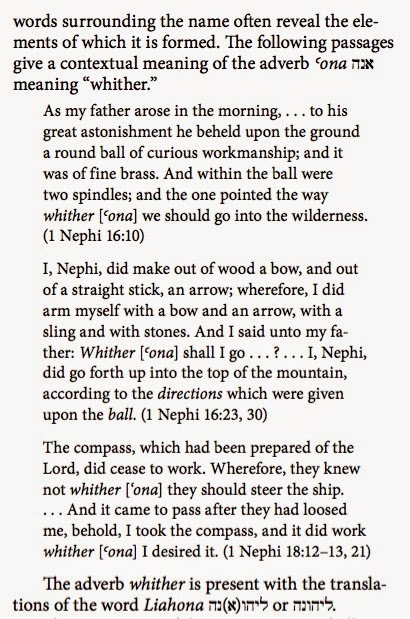 In parallel, it was on a morning in the desert when Lehi was also surprised with his discovery of another gift from the Lord to weary travelers seeking a promised land: "As my father arose in the morning, and went forth to the tent door, to his great astonishment he beheld upon the ground a round ball of curious workmanship" (1 Nephi 16:10). Round, like the "small round thing" that astonished the Hebrews on an earlier morning. Update, 1/30/15: As noted by a helpful commenter, the word "round" in this KJV verse doesn't appear to be supported by the Hebrew text and is not used in other translations. But the gist of the parallel still stands. Lehi's Liahona serves as a fitting parallel to the pot of manna, a symbol of the Lord's mercy and deliverance. And like manna, it wasn't a gift to be taken for granted, but could quit functioning as a result of rebellion. With relics to match each of the relics of the Ark of the Covenant, the Nephites could have a reasonable imitation of Solomon's temple in spirit and function, making the Holy of Holies an suitably sacred place. LON (lamed-vav-nun), Strongs 3885, from LAWAH: to abide, to dwell, to remain or to continue. Curci has much more to say about the term Liahona and its aptness in the Book of Mormon record. Just one of many cool, ancient, and increasingly plausible elements in the Book of Mormon. Stanford Carmack's discussion of the unusual grammar in the original Book of Mormon text creates a case that the unusual English of the original Book of Mormon cannot be readily explained if Joseph just created the Book of Mormon himself. The language of the King James Bible is actually quite distinct from the English that Joseph dictated. Carmack's most recent work on the topic, as I previously discussed ("New Twists," 1/08/15; also see my earlier "Joseph Smith's Hick Language," 8/29/14), takes up the use of the verb "command" in the Book of Mormon. The Book of Mormon tends to favor archaic English constructions like "command Jeff THAT he SHOULD do something" instead of the standard modern form with "to" (the infinitive form), as in "command Jeff TO stop writing so poorly." The King James Bible mostly uses the infinitive form, not the other "finite" form, when "command" governs another verb. A commenter in my last post guessed that we would find similar language in one of the other books that Joseph allegedly plagiarized from. OK, that's a testable hypothesis. So this week I looked at the texts of some of the leading books people have proposed as Joseph's source material to see how they use "command." I was not surprised to see that they provide no support for the Book of Mormon's command performance. Of course, it will take generations to sort through the ever growing and highly imaginative collection of Joseph's vast frontier library that nobody ever saw, Joseph included (though this could make a fun movie of the National Archive variety, complete with a huge underground Masonic temple lined with books), but this week I looked at the most popular recent "smoking guns." First on the list is Gilbert Hunt's The late war, between the United States and Great Britain, from June 1812, to February 1815 : written in the ancient historical style. For background, see my "Another Fun Statistical Squabble," 11/07/13 and "Curious Parallels," 11/13/13, and especially see Ben McGuire's commanding "The Late War Against the Book of Mormon," Mormon Interpreter, vol. 7, 2013. Said by some critics to be the ultimate smoking gun that proves plagiarism, a delusional conclusion obtained with bogus statistical methods, this text was written in Elizabethan-style English in imitation of King James language. Occasional similarities also derive from its many scenes of war that describe the kind of things that happen in war, as the Book of Mormon does. So if this was Joseph's secret source, now uncovered with the power of Big Data, it's relationship to the unusual language structures of the Book of Mormon might be interesting, eh? Courtesy of the remarkable online resource, Archive.org, you can see a text file with the full text of The Late War at https://archive.org/stream/latewarbetween_00hunt/latewarbetween_00hunt_djvu.txt. Other formats might be more enjoyable, such as the PDF file or the online reader. In searching, be sure to consider the occasional hyphenated form also (search for "command" as well as "com-"). 7:13 William . . . commanded the valiant men of Columbia to bow down before the servants of the king. Here 8 of 10 instances use the common infinitive form (command ... TO ...). The other two use command + that + verb. So 20% of Hunt's few uses are in the finite form, similar to what we see in the KJV Bible, according to Carmack, but quite unlike the high level in the Book of Mormon. None of Hunt's finite forms use an auxiliary verb like "should," which is common in the Book of Mormon. Doesn't look like Hunt explains the Book of Mormon's command patterns. The 1822 translation of the Quran is a little more interesting and relevant, but still fails as an explanation for Joseph's unique Book of Mormon language. Archive.org provides a text file, a PDF, and an online reader. Again, some of the important instances of command are hyphenated, so include "com-" in your search if using the text file. When "command" as a verb governs another verbs, 33 times it was in the modern infinitive form and only 8 times in the finite form. That's 19.5%, very similar to the KJV and quite unlike the Book of Mormon. 45. who also say, Surely God hath commanded us, that we should not give credit to any apostle, until one should come unto us with a sacrifice, which should be consumed by fire. 144. who hath commanded that ye worship none besides him. 277. Did I not command you, O sons of Adam, that ye should not worship Satan ; because he was an open enemy unto you? Five of the eight examples use "shall" or "should" as an auxiliary verb after "that," which may make it more similar to the Book of Mormon in that regard than is the King James Bible. So in terms of the Book of Mormon's command-related language, the 1822 Quran is certainly the best of the recently touted links found by bad Big Data (or Big Bad Data? ), but is still not very helpful and, of course, rather implausible. Just for fun, I also looked at Solomon Spaulding's Manuscript Found (text file at Archive.org), which proved to be a case of relevant command language being not found. There were 9 examples of infinitive forms but none in the finite form when command governed another verb. Yawn. So far, Carmack's thesis stands: the archaic language of the Book of Mormon cannot be readily explained by drawing from the KJV or other books in Joseph's day. I don't really know why that early archaic English is there, but whatever the reason, it is a subtle data-rich indicator of something other than imitation and plagiarism by Joseph Smith. Or do you have a better fraud-friendly explanation? The reference he gives for this claim is the Gnostic Gospel of Philip. There’s a translation on the web by Wesley Isenberg. There’s no mention in the document of “three degrees of glory.” It most definitely does not say that people must be married in the Holy of Holies in order to obtain the highest. It does compare the Holy of Holies in the temple at Jerusalem (no longer extant at the time the gospel was written) to the “bridal chamber.” The bridal chamber is a place where marriages are consummated, not where the ceremony takes place, in case there’s any confusion. The meaning of the “bridal chamber” in gnostic Christianity is a subject of debate among scholars, but there is absolutely nothing in the Gospel of Philip to back up Ostler’s claim. If you’re looking for an example of how misleading apologetics can be, this is a great one, and Mormanity uncritically propagates it to defend the faith. When I read this, I was comfortable with the basis for most of these statements based on previous reading I have done, but the statement that raised my eyebrows the most was the sentence in question. I scanned the footnotes and noticed that the intriguing #6 did not seem easy to look at right away. Curious but lacking time, I finished my blog post, and now finally am checking up on this statement, urged on by Alvin's pointed comment. After some review, at the moment I would say that Ostler's phrasing is too strongly slanted toward the LDS position, yet has a plausible basis. If he happens upon this post and has anything further to say, I would welcome that input. 6. Eric Segelberg, "The Coptic Gospel according to Philip and Its Sacramental System," Numen 7 (1960): 198-199; "The Holy of Holy Ones Is the Bridal Chamber" (Gospel of Philip 117.24-5). "The Woman is united to her husband in the Bridal Chamber" (Gospel of Philip 119.17-29). Cf. Gospel of Philip. 4-8 and 124.6ff. Does the Gospel of Philip, a document dating perhaps to the 3rd century with obvious gnostic influences, really say that you have to be married in the temple to obtain the highest of three degrees of glory? I would like to say, "See for yourself!" by simply pointing you to a translation of the Gospel of Philip such as the one of Wesley Isenberg mentioned by Alvin, found at http://www.gnosis.org/naghamm/gop.html, but without some explanation, you might have the same reaction as Alvin. First let me say that the Gospel of Philip strikes me as a text somewhat like a typical modern statement from the Chairman of the Federal Reserve Bank. When you first read it or hear it, it is puzzling and doesn't seem to say much of anything meaningful. But those with ears to hear can pick it apart, using the proper lens to elucidate its rich meaning so that they can respond appropriately, usually by panicking. As I understand it, when the Gospel of Philip was written, the temple was long gone. But sacred rituals and teachings rooted in the temple continued among some parts of Judaism and Christianity. Temple imagery in the Gospel of Philip should not be taken as a literal description of what happened in the non-existent temple of that day. It might be better to take it as a collection of doctrines in one branch of Christianity rooted in temple lore and mysticism. Perhaps the sacraments were done in that day in imitation of or in memory of the old ways of the temple, perhaps using churches or private rooms in the absence of the temple they longed for. [W]e can now turn to a large collection of early Christian initiation texts that was updated in 2003 by Dr. Maxwell Johnson of Notre Dame University. This collection is called Documents of the Baptismal Liturgy. Throughout these texts are references to temple terms such as laver, altar, sacrifice, incense, priest, Levite, and high priest. There are even statements in these documents that initiates are going to enter into the temple of God to receive certain ordinances and also enter into the Holy of Holies (the Liturgy of Jerusalem—from about 350 A.D.—uses both of these terms—temple and Holy of Holies—to describe the building where the liturgy takes place). But however literal or symbolic its temple elements are, I suggest that the Gospel of Philip is a valuable text showing what some ancient Christians believed regarding marriage and other vital sacraments. Truth did not come into the world naked, but it came in types and images. The world will not receive truth in any other way. There is a rebirth and an image of rebirth. It is certainly necessary to be born again through the image. Which one? Resurrection. The image must rise again through the image. The bridal chamber and the image must enter through the image into the truth: this is the restoration. Not only must those who produce the name of the Father and the Son and the Holy Spirit, do so, but have produced them for you. If one does not acquire them, the name ("Christian") will also be taken from him. But one receives the unction of the [...] of the power of the cross. This power the apostles called "the right and the left." For this person is no longer a Christian but a Christ. A bridal chamber is not for the animals, nor is it for the slaves, nor for defiled women; but it is for free men and virgins. Through the Holy Spirit we are indeed begotten again, but we are begotten through Christ in the two. We are anointed through the Spirit. When we were begotten, we were united. None can see himself either in water or in a mirror without light. Nor again can you see in light without mirror or water. For this reason, it is fitting to baptize in the two, in the light and the water. Now the light is the chrism. There were three buildings specifically for sacrifice in Jerusalem. The one facing the west was called "The Holy". Another, facing south, was called "The Holy of the Holy". The third, facing east, was called "The Holy of the Holies", the place where only the high priest enters. Baptism is "the Holy" building. Redemption is the "Holy of the Holy". "The Holy of the Holies" is the bridal chamber. Baptism includes the resurrection and the redemption; the redemption (takes place) in the bridal chamber. But the bridal chamber is in that which is superior to [...] you will not find [...] are those who pray [...] Jerusalem who [...] Jerusalem, [...] those called the "Holy of the Holies" [...] the veil was rent, [...] bridal chamber except the image [...] above. Because of this, its veil was rent from top to bottom. For it was fitting for some from below to go upward. The powers do not see those who are clothed in the perfect light, and consequently are not able to detain them. One will clothe himself in this light sacramentally in the union. In this world, the slaves serve the free. In the Kingdom of Heaven, the free will minister to the slaves: the children of the bridal chamber will minister to the children of the marriage. The children of the bridal chamber have just one name: rest. Altogether, they need take no other form, because they have contemplation, [...]. They are numerous [...] in the things [...] the glories [...]. I was uneasy after reading this, especially the part about the slaves serving the free, but before I panicked I remembered that this was NOT a Federal Reserve statement. Just an ancient Christian document. Whew. First note that Ostler does cite two sentences from the Gospel of Philip which are actually there in the text: "The Holy of Holy Ones Is the Bridal Chamber" and "The Woman is united to her husband in the Bridal Chamber." In Isenberg's translation these become "'The Holy of the Holies' is the bridal chamber" and "But the woman is united to her husband in the bridal chamber." Close enough for me. So what these two sentences and the associated passages appear to be saying is that one of the essential sacraments for salvation, perhaps the highest one of all, is sacrament of marriage, and that this union of man and woman takes place in the Holy of Holies (also called the bridal chamber, which, earlier in the text, is said to be mirrored, which is also intriguing). This sacrament appears to be essential for the full blessings of the Gospel in the Kingdom of Heaven. However, the concept of the three degrees of glory does not appear to be present in these passages, and that is the primary basis of the complaint posted at Mormanity. Did Ostler overreach or casually conflate the Gospel of Philip with other early Christian references that do more clearly speak of three degrees of glory? Let's look at the first citation given in footnote 6, the Segelberg reference from the journal Numen. Initial searching took me to its JSTOR publisher, where I was planning to buy a copy of the article but could not because of a server problem at JSTOR. Later I found a Scribd version of the Numen volume where I could read the entire Segelberg reference. Segelberg gives special emphasis to the sentence translated above as "The Lord did everything in a mystery, a baptism and a chrism and a eucharist and a redemption and a bridal chamber." He sees this as a list of 5 sacraments, including nymphon (involving the bridal chamber). So perhaps if the progress from the first through the last of the three chambers of the temple is taken to represent the three heavens or three degrees of glory, then one could infer that the highest of the sacraments, associated with the highest and holiest of the three chambers of the temple mentioned in the Gospel of Philip, is essential for reaching the highest of the three degrees of glory. But Segelberg does not make that point expressly. From an LDS perspective, it's possible to connect the dots and paraphrase the Gospel of Philip as Ostler did, but I think his one-sentence statement could have been expressed without directly invoking LDS terminology about the three degrees of glory. More explanation in that sentence would have been helpful. However, Ostler's whole passage is a telegraphic delivery of rather sensational but supported highlights from early Christianity that are relevant to the LDS temple tradition, briefly mentioned as background leading to the core of his discussion on the issue of sacred vestments. The wording in the sentence mentioning the degrees of glory could have been toned down or the footnote amplified with further references (see below), but this is a minor gap. There is actually serious content worth considering behind Ostler's brief statement and useful footnote. Alvin, the commenter at Mormanity who complained about my endorsement of Ostler's work, may actually be right: "If you’re looking for an example of how misleading apologetics can be, this is a great one." Agreed, but I hope it's an example that won't just make you fume, but might make you ponder as well. There's often much more to LDS claims than just smoke and mirrored bridal chambers. Yes, LDS apologists do make mistakes. If you feel Ostler made a mistake with inadequate documentation and overreaching, let me help correct that by filling in some blanks. For starters, take a look at Barry Bickmore's book, Restoring the Ancient Church: Joseph Smith and Early Christianity, especially the chapter "Salvation History and Requirements" which has a section on the three degrees of glory and connections to early Christian teachings. That section was the basis for FairMormon.org's page on the three degrees of glory, which lists a variety of ancient Christian sources giving support for that concept. Whoops! Never mind. I just noticed that there are numerous footnotes on that web page and especially in Barry's book, and unfortunately, I haven't checked them all yet. Sigh. That's why I also can't mention, by way of further interesting background, John A. Tvedtnes' 1999 presentation, "Early Christian and Jewish Rituals Related to Temple Practices." Another 50 footnotes? Forget it. Ditto for Matthew Brown's presentation, "The Israelite Temple and the Early Christians" with 47 mostly unchecked footnotes. Someday I'll be able to mention it in good faith, but not today. Do you have some favorite temple-related sources whose footnotes you've carefully checked that we can share here? For those interested in better understanding how the controversial gnostic document, the Gospel of Philip, links LDS concepts with some early Christian threads (mingled with questionable content, of course), there's another scholarly article I found helpful. It comes several decades after Segelberg's initial examination of the Gospel of Philip and challenges part of Segelberg's interpretation. I refer to April D. DeConick, "The True Mysteries: Sacramentalism in the 'Gospel of Philip,'" Vigiliae Christianae, Vol. 55, No. 3 (2001), pp. 225-261, http://www.jstor.org/stable/1584809, with the full text available for free at Rice.edu. DeConick challenges Segelberg's view that the five sacraments listed in the Gospel of Philip are limited to five specific rituals, and raises that possibility that some sacraments transcend rites but, like marriage itself, involve life extensive experiences that bring us closer to God. I see that as a valuable perspective on marriage and sacraments that need not do away with the importance of the rites that launch those life experiences. DeConick opens with an important review of Jewish traditions about the ascent into the presence of God, wherein temple rituals were to be transformative, providing secret knowledge of the ways of God and bringing one into God's presence. This again puts the LDS temple concept on solid ancient ground. She then speaks of the three temple shrines in the Gospel of Philip. She sees the Gospel of Philip as having a "celestial Temple tradition" that parallels the Jewish temple tradition. It seems then that the expression "Bridal Chamber" is really equivalent to the "Holy of Holies" when one understands how these words functioned in Hebrew! Some of that certainly resonates with LDS concepts. Though parts of it confuse me, I agree with the Gospel of Philip on several points, including this one: "Great is the mystery of marriage!" I am also grateful to have married my sweet angel, and look forward to the future blessings the Gospel can bring. The Book of Mormon has long been a controversial book to the world, but we must also recognize that it is increasingly controversial within the Church. The debate over its origins — is it an authentic ancient document or modern fiction concocted by Joseph Smith? — occurs not just between Mormons and non-Mormons, or between the faithful and those losing their faith, but has also extended among the ranks of those who consider themselves faithful Mormons. There are some who respect the Book of Mormon yet feel it is not derived from an ancient text but somehow stems from Joseph Smith's mind and his environment. That may seem bizarre to many faithful Mormons, but especially among academics, there are strong pressures to humanize the roots of our religion and the "keystone" thereof, seeing such things from a purely naturalistic perspective. However inspiring and "truthy" the Book of Mormon may be, from that perspective it must ultimately be fiction. It is a perspective I reject and find inconsistent with my personal experience and with abundant evidence, beginning with the witnesses of the gold plates and the extensive evidences from the text itself and beyond. But I feel it is vital to understand the debate if only to avoid being blind-sided and caught off guard when one finds occasional fellow Mormons teaching something quite surprising. Two recent publications give insights into the ongoing debate over the origins of the Book of Mormon. One of these comes from the Mormon Interpreter, the publication edited by Daniel Peterson that is a leading source for scholarly investigation into LDS issues pertaining to our scriptures. The first article is "What Command Syntax Tells Us About Book of Mormon Authorship" by Stanford Carmack in Interpreter: A Journal of Mormon Scripture 13 (2015): 175-217. This is a highly technical and challenging article, but one that adds important new evidence to previous recent scholarly observations showing that the English language dictated by Joseph Smith during the translation of the Book of Mormon was not simply derived from the language of the King James Bible nor the English of Joseph's day. Rather, there is a compelling case that the translation was somehow given in language predating the KJV by roughly a century or more. I mentioned this in my previous Nauvoo Times post, "The Debate Over Book of Mormon Translation: Loose or Tight?" Brother Carmack's latest contribution looks at the complex ways in which the verb "command" is used in the Book of Mormon, and multiple issues point to usage patterns that are surprisingly close to English around 1500, and significantly different from the statistical patterns of the KJV. However this was done and why, it severely undercuts any theory that relies on Joseph Smith as the source of the translation. Carmack offers plausible reasons why these long-unnoticed characteristics of the original English point to a process outside of Joseph's abilities — in other words, evidence for detailed divine intervention in at least some aspects of the translation. The controversial Maxwell Institute article comes from an LDS scholar who apparently embraces Mormonism but appears to be has been viewed as casting at least some doubt on the historicity of the Book of Mormon. The article is "The Book of Mormon and Early America’s Political and Intellectual Tradition" by Benjamin E. Park, Journal of Book of Mormon Studies, 23 (2014): 167–75. Dr. Park, an associate editor of the Maxwell Institute’s Mormon Studies Review (the successor of the FARMS Review that Dr. Peterson edited from 1988 through June 2012) reviews David F. Holland, Sacred Borders: Continuing Revelation and Canonical Restraint in Early America (2011), and Eran Shalev, American Zion: The Old Testament as a Political Text from the Revolution to the Civil War (2013). When I spoke of the methodological limitations of past discourse, I did not mean that viewing the Book of Mormon as an ancient text is a mistake. I simply meant that the important scholarly work on questions of central importance to an internal, predominantly Mormon audience has paved the way for a broader scholarly conversation about ways that Joseph Smith and his religion connected with other streams of nineteenth-century thought. I in no way expect or want scholarship that explores an ancient setting for the Book of Mormon and other questions of vital importance to Mormons to cease—indeed, the very first page of my review notes that these past discussions are both important and should continue. There is nothing about this new work that precludes continued attention to questions surrounding the text’s ancient origins. I was pleased to see that the very issue of the Journal of Book of Mormon Studies in which my review appeared featured several articles that explored the Book of Mormon’s ancient setting, a form of scholarship that the Maxwell Institute continues to support. I regret that the talk surrounding my emphasis on the nineteenth-century context has overshadowed the primary point of the last few pages of my review: that even the contextual frameworks ably provided by Holland and Shalev don’t fully capture the breadth and depth of the Book of Mormon, as the book continues to elude narrow categories of contemporary analysis. This is a helpful statement, but I don't think this removes the controversy or eliminates the grounds for debate. I am glad to see that Park does not reject the ancient roots of the Book of Mormon. Perhaps Dr. Park in his role as a scholar addressing a broad audience did not realize how his words would be taken as undermining the authenticity of the Book of Mormon as an ancient book. And perhaps some readers like myself fail to fully appreciate the value of contextualizing the Book of Mormon and the roots of Mormon religion in light of related nineteenth century trends using modern scholarly tools and paradigms. Indeed, it is fair to recognize that at least some aspects of the Book of Mormon, especially the language and the work of preparing a text, obviously had to be influenced in various ways by the linguistic and cultural environment of Joseph Smith. But as noted below, there may still be some serious surprises in that area that challenge all of our prior assumptions about the translation of the text. The purpose of this post is not to criticize Park but to point to some of those new but still very tentative surprises that might need to be considered in future debate, and which can be interesting areas for ongoing research. For a publication coming from BYU's Maxwell Institute, this can easily be viewed as controversial material worthy of debate and response. Daniel Peterson briefly summarizes the controversy and challenges Park in his LDS blog at Patheos in the post, "Recovering, at long last, from the plague of Mormon exceptionalism." The comments there help reflect the depth of the controversy and the divide that can occur among LDS thinkers on both sides of the debate. The book’s third chapter attempts to, as announced in its title, chart the “cultural origins of the Book of Mormon.” More particularly, the chapter examines the growth of what Shalev calls “pseudobiblical literature,” which used Elizabethan English and a biblical message in order to add a divine grounding to the nation’s message. During the early republic, Shalev explains, a preponderance of texts sought to imitate the Bible’s language and message while validating America’s destiny and purpose. “By imposing the Bible and its intellectual and cultural landscapes on America,” American Zion explains, “those texts placed the United States in a biblical time and frame, describing the new nation and its history as occurring in a distant, revered, and mythic dimension” (p. 100). These texts sought to collapse the distance between past and present—making both the Israelite story relevant as well as the ancient language accessible. This republicanization of the Bible possessed significant implications for American political culture. Beyond merely expanding their historical consciousness and placing America within an epic narrative of divine progress, the Old Testament added a pretext for such actions as those supposedly provoked by manifest destiny. Ironically, the Book of Mormon appeared after the apex of this literary tradition. By the time Joseph Smith’s scriptural record was published, texts written in the Elizabethan style were on the decline, and most works were presented in a more modern, democratic style. On the one hand, this made the Book of Mormon the climax of the pseudobiblical tradition; on the other hand, the book acts as something of a puzzle. Shalev writes that the text “has been able to survive and flourish for almost two centuries not because, but in spite of, the literary ecology of the mid-nineteenth century and after” (p. 104). While this may be true—and Shalev is persuasive in showing how the Book of Mormon appeared at the most opportune time to take advantage of its linguistic flair—his framework overlooks the continued potential for creating a sacred time and message through the use of archaic language. Not only did other religious texts replicate King James verbiage throughout the nineteenth century, but so did varied authors like the antislavery writer James Branagan, who used antiquated language in order to provoke careful readings of his political pamphlets. Yet despite this potential oversight, Shalev’s use of the linguistic environment in order to contextualize the Book of Mormon is an underexplored angle that adds much to our understanding of the text. The Elizabethan language of the Book of Mormon is widely assumed by critics, non-LDS scholars, and some LDS people as evidence of Joseph Smith's authorship of the text, while those believing in the authenticity of the book have often defended that language as a reasonable stylistic choice for the divinely aided translation. What is interesting now is that this entire debate may have been based on a faulty assumption, the assumption that the language Joseph dictated is KJV Elizabethan. The recent work of Carmack, building on Royal Skousen's detailed analysis of the original text of the Book of Mormon, reveals a surprise that may turn the tables on the critics and some scholars: it isn't Elizabethan dating to the 1600s, but Early Modern English from a century or so before. The Book of Mormon contains old, distinctive syntax that is nevertheless plain to the understanding. In view of Moses 1:39, the Lord wants us to take the Book of Mormon seriously. Many have begun to doubt the historicity of the book in part because they have decided that Joseph Smith is the author of the English-language text. Ample syntactic evidence tells us that he could not have been the author. I am confident that the Lord knew that we would eventually find this out, and that we would learn about it at a time when we had a strong need for solid empirical evidence that the book was divinely translated, which points ineluctably to historicity. Based on the distressing turn of events I see at the Maxwell Institute, I'd say This new evidence about the non-KJV origins of Book of Mormon English may be coming just in time. The timing, in fact, may be rather providential. But more research is needed on the linguistic relation of the original Book of Mormon text to Early Modern English and texts of Joseph's day. This could be quite interesting to see where this pursuit leads. One thing I especially agree with in Park's essay and in Carmack's comments is the need for further scholarship in this area. It is a puzzling but intriguing vein that needs to be mined much more deeply using the tools and knowledge we now have that simply was not available a few years ago. Latter-day Saints are taught to love one another and to frankly forgive offenses. My life was changed by a saintly patriarch. He married his sweetheart. They were deeply in love, and soon she was expecting their first child. The night the baby was born, there were complications. The only doctor was somewhere in the countryside tending to the sick. After many hours of labor, the condition of the mother-to-be became desperate. Finally, the doctor was located. In the emergency, he acted quickly and soon the baby was born, and the crisis, it appeared, was over. But some days later, the young mother died from the very infection that the doctor had been treating at another home that night. The young man’s world was shattered. As the weeks wore on, his grief festered. He thought of little else, and in his bitterness he became threatening. Today, no doubt, he would have been pressed to file a malpractice suit, as though money would solve anything. This had been my friend’s trial. How could he leave it alone? A terrible wrong had been committed. He struggled to get hold of himself and finally determined that he should be obedient and follow the counsel of that wise stake president. He would leave it alone. "Let it go." Many times we need this kind of inspired counsel in our lives as we become obsessed with retribution, vengeance, or our own lofty definitions of justice. Many times our fruitless and hurtful pursuits would have been better dropped. Take a moment today to prayerfully examine some of your own grievances against others and consider whether the Lord is trying to urge you to be more wise and just let it go. Nearly 40 people died last night in a tragic stampede in Shanghai, just a short walk from the Bund Center where I work. To the right is a photo of portion of the Bund in Shanghai, near the region of the stampede. I've been to the area of the tragedy many times and have experienced the intense crowds that can form on almost any day of the week (the biggest crowds tend to be near the Peace Hotel, the building with the green pyramid on top). The New Year's Eve crowd must have been far denser than average. As the crowds gathered at Shanghai's most popular area to celebrate the arrival of 2015, apparently someone from a bar on the 4th floor of a building overlooking the Bund tossing out what looked like American money. Initial reports say it was money, but it now appears that the paper was just a coupon advertizing the bar. The people below thought it was American money and many started grabbing the money, perhaps stooping down to pick up money, and a chain reaction of falling people may have been started in the press of the crowd. Heartbreaking, troubling, and so unnecessary in one of the safest and most pleasant large cities in the world. My sympathies to the many families and friends suffering loss. Coupons or real cash, the tragic result of someone "giving" foolishly is a reminder of the unintended consequences that can occur when we toss out money or gifts without considering the possible results. Sometimes acts of giving can verge on the criminally irresponsible, even if there were some form of good intentions. The intentions in this case, though, may not have been all that good. If the purpose was to benefit the giver, as might have been the case, then we also have a tragic object lesson about the business model that many follow these days, including those who seek power by being irresponsibly generous with other people's money. Sometimes giving can be callous. I saw an act of this kind recently in Shanghai when a man walking by a beggar with a severe deformity smirked as he tossed a couple of coins behind his back at the beggar and then turned to watch the man scramble a bit for the money on the sidewalk. Maybe the giver meant well, but there was an air to the act that saddened me. Much worse, I've heard of tourists on cruise ships at port tossing coins to throngs of children below to watch them scramble and struggle for the money. In the Gospel of Jesus Christ, giving and generosity is essential, but we are taught to give out of love, not a desire for selfish gain or publicity. We are taught to minister to individuals and to seek inspiration through the Spirit of God to best tailor what we do to meet the real needs of those we help. We are taught to consider the consequences of what we do and seek carefully to do what will genuinely bless the lives of others. We must not ignore those in need. We should be generous when possible and kind always. For those we do not know well, for situations far too complex for us to know how to best help, we often can't make a wise decision on our own, and need to be sensitive to the whisperings of the Spirit to know how to help to do real good. Update: When I got back to Shanghai on Jan. 2, my cabbie (usually a good source of info on current events) explained that the authorities now think that the coupons tossed from the bar were not the cause of the stampede. The place where people were being injured in the stampede was across the street from the bar, not just below it, so it's unlikely to have been the cause.